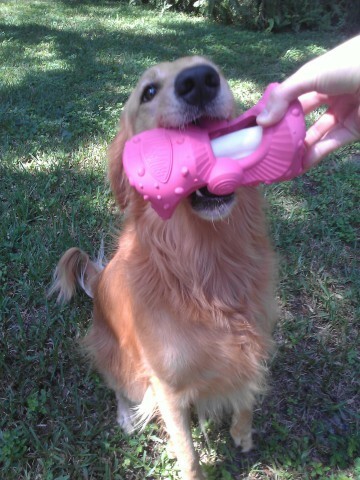 I called out the Pawabunga!” crew earlier this month in a list of the toughest chew toys that I could find online, and they kindly sent a sample Ruffhide for Jessie to put to the ultimate test. Without giving too much away, is this the dog toy of the year for chewers? 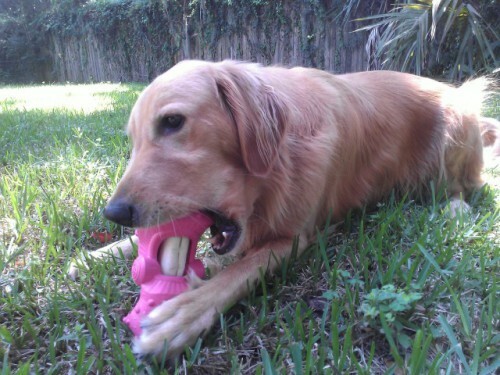 We were given a large “Deep Pink” Ruffhide, which came preloaded with a massive roll of beef rawhide. 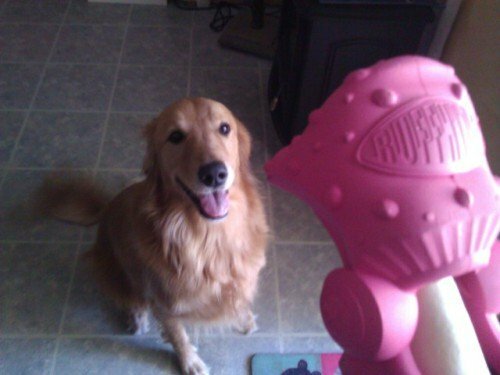 Jessie was excited as always to get a new toy, but I have never seen her so determined! I can’t give Jessie a rawhide as a chewy treat, because the golden giant will “chew” them for less than a minute before swallowing the entire rod/roll/stick, and that can’t be good for her tummy, right? As soon as Jessie realized that the Ruffhide toy was more than a bouncy, rolling, (and very rugged!) plaything, and that it contained the largest chunk of continuous piece of rawhide that she’s ever had, her single goal in life was to get it out! Whether you call her determined or demented, Jessie tried every method at her disposal to get the rawhide out of the Ruffhide’s rubbery shell: When she tried to crush it out via brute force, it was cushioned by the rubber, and if she tried to surgically pick at it with her front teeth, the rawhide would (frustratingly) spin around the inside of the toy, so she couldn’t get a grip on it! Sure, she eventually ended up getting the rawhide inside by the unconventional method of softening it with her unrelenting drool and by pulling it out bit by bit, but that’s absolutely natural. She’s such a smart dog, that she needed this tasty challenge to occupy her time, and Pawabunga! gave me a fantastic way to give Jessie a rawhide treat when I need some “me” time. 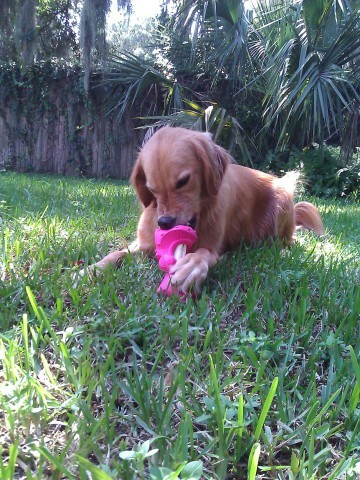 While she had a blast working the treat from its rubber prison (and she enjoyed playing with the empty toy afterward! ), I had just as much fun watching her try different tactics to work at it. Between the frustratingly rewarding puzzle that Ruffhides provide your family’s ultimate chewer, the available refills of rawhide, beef pizzles and the greatest natural chewing material I’ve ever seen, the Himalayan dog chew, the enduring empty rubber toy and the fact that any “chewy” dog will get more than your money’s worth from the entire package makes Ruffhides an extremely strong contender for dog toy of the year. Two paws way up! Don't forget that you can find plenty of Ruffhides on Amazon too!